Grammy Award-winning vocal group Little Big Town returned to the famed Ryman Auditorium for back-to-back sold-out performances on Friday and Saturday evening as part of their unprecedented year-long artist residency, “Little Big Town at the Mother Church.” The critically-acclaimed entertainers once again brought their pitch-perfect vocal stylings to the Mother Church with a set list that included songs from their recently released #1 Billboard Country, Top 10 Billboard 200 studio album, The Breaker (Capitol Records Nashville), and their impressive catalogue of hits. Opening acts included Monument Recording artist Caitlyn Smith (5/19) and The Brummies (5/20). The night also included a preview of the band’s upcoming wine, “4” which was first announced earlier this year on CBS This Morning and will be available for consumers starting in June. “Little Big Town at the Mother Church” is the only year-long artist residency in the 125 year old history of the Ryman. 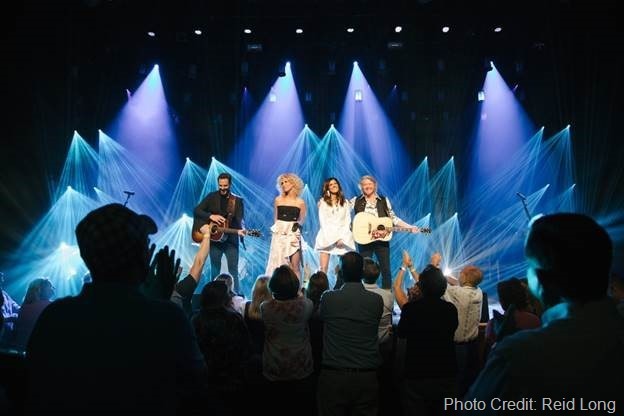 In a recent sit down with Sunday Today, Little Big Town sat down to speak with Willie Geist about what it means to them to be at the Ryman Auditorium and the band’s bond as a family. Little Big Town will perform next on “The Voice” finale tomorrow night, May 23 on NBC at 9/8c.